Fabulous fish and chips in Camden, flawlessly fried and with superior condiments. Only fish that is sustainably caught gets hooked by Hook. Hook will make you feel as if you’re at the seaside. The simple, maritime-themed furnishings are reminiscent of a beach hut. The walls are painted blue like sea and sky. And, as on any seaside visit, you’ll be eating fish and chips. But not just any old fish and chips. Forget about slabs of grey flesh in thick, greasy body bags of batter. Think instead sea bass in a lime, mint and wasabi batter, applied sparingly; think Cajun spiced hake; think cod in a ‘classic’ batter made of panko – Japanese breadcrumbs. Barely a hint of grease in either one, and fish perfectly cooked: juicy and tender. The menu changes daily. Hook gets some of its fish from Cornish day boats; catches vary day by day. Some other fish are farmed, and they’re not afraid to use lesser-known species such as gurnard and ling. The catch makes it to NW1 speedily, and is served very fresh. Side dishes on our visit included a tasty celeriac slaw and a salad with samphire. We got a sampler plate of all their sauces, and they’re good, but the battered fish is so fine that it doesn’t need anything else. If you want vinegar for your chips, you’ll get a dinky atomiser of the sherry variety: classy. Our deep-fried rounds of potato tasted great, but needed a bit more chippy crunch. The drinks list is basic, but a small selection of bottled beers should do the trick. You may find a family at the next table, or a group of friends celebrating in sybaritic style. Camden Town is rapidly learning that it does like to be beside the seaside. And so do I. In fact, I’m hooked. Best fish and chips in London, And the new menu offer something for those who don’t like fish, always an excellent meal. Probably best fish and chips in town! We opted for the standard fish and chips and the sides to go along. The fish was fresh and nicely cooked. Huge selection of dips to accompany the fish as well. Staff were friendly and the atmosphere was causal so would definitely recommend to give this a try. 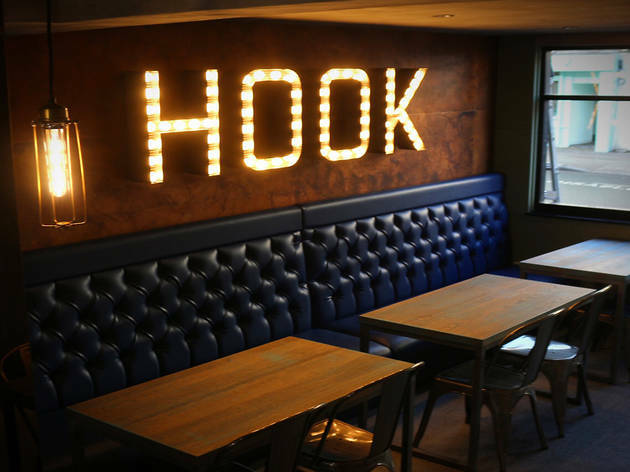 Hook takes the standard fish and chips experience up a notch or two by combining great quality with a variety of unique flavours usually reserved for other dishes. I tried the lemon and basil tempura sea bream with truffle dip while my dining partner had the Guinness battered fish. Both dishes a were exceptional and the unique flavour twist really made the experience memorable. Highly recommended! Seriously delicious fish & chips. Different, interesting flavours of fish, combined with chunky, seaweed salted chips, and a range of delicious dipping sauces. Our waiter was very friendly and was happy to explain the menu in detail to us, as well as recommend beers to go with our chosen fish, on several occasions. The only reason I haven't given 5 stars was because it felt like our waiter upsold at every opportunity, and as a result, we ended up with 3 large jars of pickles that cost £3.50 each, when one jar would have been more than enough for 3 of us to share. That left a bit of a sour taste in our mouths when we realised we had paid £28 a person for fish and chips with a couple of beers! Also, weirdly, they had the same strange song on repeat for literally the whole 1.5 hours that we were there. One song can get amazingly annoying after you've heard it 47 times. I'd go again, but I'd stick to a quick dinner of fish, chips, and a beer, and then leave. This was the best fish and chips in London! I honestly have never tried so many amazing types and flavours of fishes. I recommend going for the basil one with garlic truffle sauce! I am salivating just thinking about it! Top place! Best Fish and Chips in London. There's a reason this place is held in such high regard. So many chippies recycle the same tired old offerings and do fine. What sets Hook apart is that they're reinventing the wheel and making fish & chips more of a gourmet experience. Normal greasy chips with salt & vinegar are subbed for seaweed salted wedges with basil & chili dipping sauce. Even the fish is not your standard cod or haddock, I had Lemon & Basil Tempura Sea Bream, so you know it's top quality. They're in Camden and Brixton, go get some! Wow. I can see what all the fuss is about. Stunningly good fish and chips with huge portions. It's worth making a trip. Fabulous casual restaurant for fish-lovers seeking a posh(ish) lunch or fairly inexpensive dinner. Who’d have thought there were so many ways of creating fish and chips? The menu varies from the classic cod with chips and mushy peas, to a selection of mash-ups such as lime and wasabi tempura, or Jamaican jerk flavours. Bizzarely and pleasingly, it all works. Portions are exceedingly generous. Try the special – they usually offer a fish taco meal deal which is fantastic value and a slightly lighter lunch option. Simply put, the best fish and chips in London. Look forward to my next visit! My favorite fish and chips in London so far. A great addition to Camden town. Cooked to perfection,nice decor and friendly service. If you’re really craving a good fish and chips, and you haven’t got the mental strength to deal with soggy batter or hard chips – then head straight to Hook. They certainly know how to serve the nation’s favourite, with a bit of a twist too. With a variety of different batter options, any choice won’t leave you dissatisfied. The fish is fresh, the staff know their stuff and they even have Salted Caramel Guinness Ice Cream. I. KID. YOU. NOT. Best fish and chips anywhere! So fresh, crispy and delicious looking forward to my next visit! Fantastic fish and chips. Generous portions, nice wine, great value for money! Amazing, fresh, tasty and sustainable! As a Londoner, I have never travelled for fish and chips before but Hook is definitely worth the trip to Camden. It's no ordinary fish and chips! Simply , alongside Hook Brixton , the best fish in London bar none !!! The best Fish and Chips in town!!! A new style fish and chips that is a breath of fresh air from the greasy norm. The sauces give just as much enjoyment as the fish. If you love fish & chips you have to try it. Delicious food and super friendly service! Best fish and chips and the ice cream! Best fish and chips in London! One of the best Fish and Chips in London. And by bar, a very good option to eat in Camden. It between Regents Park and Camden Town station, so it's pretty close to the spots, but it's not a place for tourist that don't know where they go. Specially the chips were great!!! Just divine! Honestly, the freshest tastiest fish I have ever had. Completely chilled, no fuss setting, simple menu but WOW. I cannot recommend enough - you must go immediately!